This two-gallery art exhibit celebrates the 40th anniversary of the choreopoem, for colored girls who have considered suicide/when the rainbow is enuf, and is curated by Souleo Wright. Through 20 commissioned artworks by artists including Margaret Rose Vendryes, Renee Cox (in collaboration with Rafia Santana), Kimberly Mayhorn, Dianne Smith, and Danny Simmons the exhibition is a tribute to the Broadway play. Each work honors the individual poems and underscores their enduring significance in highlighting issues impacting the lives of women of color. 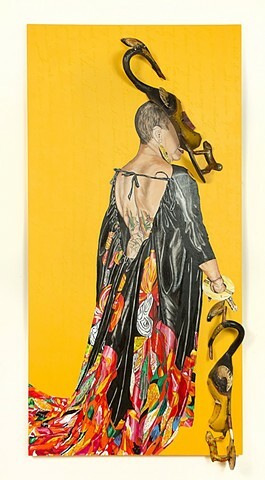 Additional works by nationally acclaimed artists including Deborah Willis, Carrie Mae Weems and Saya Woolfalk further expand upon related themes of sexuality, race, sisterhood, violence and self-love depicted in and inspired by Ms. Shange’s work. The exhibition will also include archival material that highlights the creation and evolution of the original text from its 1974 California debut to its Broadway run, courtesy of the Barnard Archives and Special Collections at Barnard College. i found god in myself originally debuted in 2014 at the Schomburg Center for Research in Black Culture, Long Gallery Harlem (formerly The Sol Studio) and La Maison d’Art.